100% Pure Natural Sweetener. Natural energy source. Same Great Taste. Brand New Look! 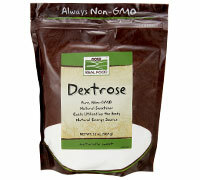 Dextrose is another name for glucose, a simple sugar that plays an important role in cellular energy production. Dextrose is actually the primary source of energy for most living organisms. Now Real Food Dextrose is a natural sweetener derived from corn with moderate sweetness and a fine texture that's easily utilized by the body. Dextrose is particularly beneficial for active individuals as an energy source before and during workouts, and for replenishment of energy levels post-workout. Use in place of table sugar at a 1.3:1 ratio.